The combat of Dredd VS Death is a little tricky at the start because you just cannot go around shooting like crazy because of the law meter. Your choice of weapon in the game is the lawgiver that can fire six different types of ammunition such as armour piercing and explosive and was easily my favourite weapon in the entire game as it was extremely reminiscent of the Sylvester Stallone Judge Dredd movie. There are also a variety of other weapons in the game such as shotguns, sniper rifles and grenade launchers but you will probably find yourself reverting back to the lawgiver in times of need. As with all first person shooters on the consoles, the auto-aim is extremely forgiving, thus making it an extremely easy control system to master. Dredd VS Death also contains a variety of multiplayer modes that allows up to four players to play simultaneously on the XBox. The multiplayer modes include your favourites such as deathmatch and some new formats such as blockwar, elimination, umpty raid and even team deathmatch. Like Halo on the XBox, Dredd VS Death also supports a very in-depth cooperative mode that allows you and a friend to play the entire single player game together. There is even an arcade mode that allows you to go in with guns blazing by completing certain mini-quests such as scoring the highest arrests of killing vampires etc. The graphics of Dredd VS Death as with the PlayStation look very dated on the XBox but the gaming environments are simply huge and there is only a minimal amount of slowdown in the game and considering how much graphics are being moved on screen at once, you can almost forgive it. Mega-City One has been faithfully recreated in the game with a dark atmosphere that pays homage to the original comic series. The texture details in the cityscapes, although limiting are a marvel to look at and there are also various Mega-City One propaganda littered throughout the city from posters to futuristic holographs. 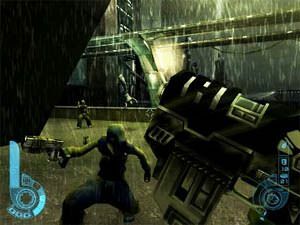 The game also contains some brilliant special effects such as realistic weather conditions (the rain looks amazing), awesome lighting effects and of course the gunfire from your weapons. 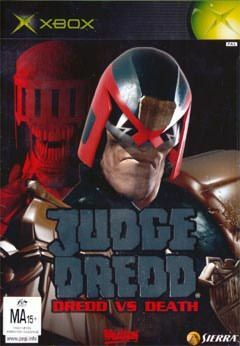 The characters in the game are also well modelled that contain an average high polygon count with some decent looking textures for the realistic Judge Dredd style. 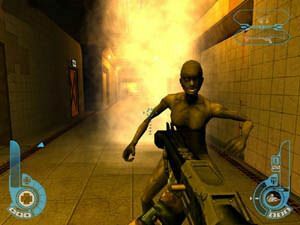 Gamers will also get a kick out of the way you shoot the enemies in the game because they do the "bacon" dance when you shoot them multiple times and their bodies start shaking violently when they get shot. Apart from the well modelled characters, all the characters in the game move extremely well and there is no clipping whatsoever. 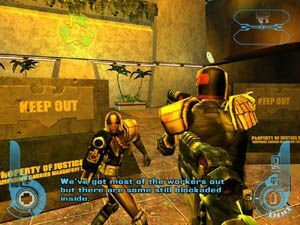 In conclusion, Judge Dredd: Dredd VS Death isn't the most original game out there and unfortunately the graphics engine is a little dated but it will definitely will win some gamers over because of the addictive gameplay and interesting storyline. Unfortunately the XBox version of the game is probably the most disappointing when compared to other formats because everyone knows that the XBox can do quite a bit better than the PlayStation 2 or to some extent, even the PC and this game is an almost straight port. Worth checking out though!